AMRAZ is Israel’s largest P.E.T. packaging manufacturer. Their customers internationally include most of the major beverage and dairy companies. They produce preforms, bottles and closures for a broad range of products. 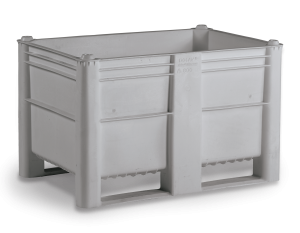 44" x 44" x 31.5"
In the Israeli plant where preforms are manufactured, AMRAZ was having serious problems in storing, conveying and shipping the preforms. AMRAZ was using cardboard cases with a volume of one cubic meter on a wood pallet. 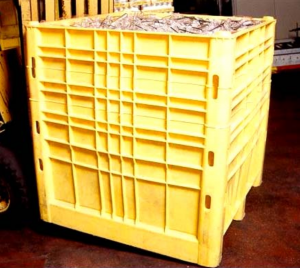 These cases proved very problematic when stacking, they found that the bottom layers were not protected. Although there was no visible damage, it was found that these preforms were showing cracks and leaks during and after the filling process. In order to prevent this, they could not be stored more than two high. DOLAV was asked to solve the problem. 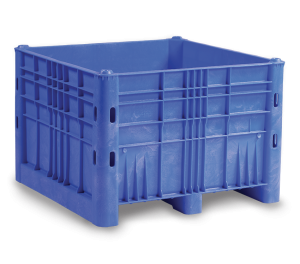 DOLAV box pallets, type 1120 (1120mm x 1120mm- 44”x44”) extended to 1000 mm high was DOLAV’s solution for both the plant in Israel and the plant in Romania. 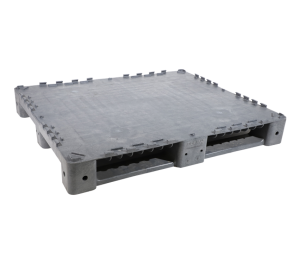 These box pallets, although weighing only 53 kilos (117 pounds) each, have two-way entry fork openings, can be safely stacked bearing weights of almost 9000 pounds, are easily steam cleaned and extremely durable. 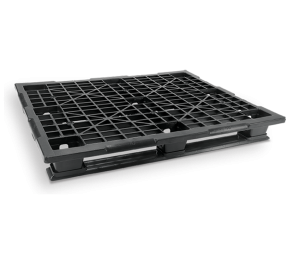 Now, in the same pallet space as previously, a 3 high stack is possible thereby increasing the amount of preforms by over 250%. Damaged preforms are now less than 1%. No more wood chips or paper will be found in the sterile areas. 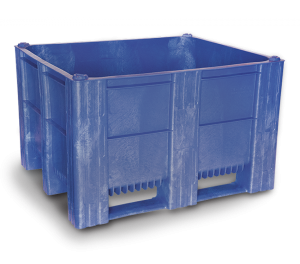 By using all plastic, returnable and re-useable packaging, AMRAZ has saved thousands of Dollars by improved space usage on trucks and warehouses, less damaged product and greater efficiency. 39.37" x 47.24" x 29"